Given that we live in the Sea to Sky corridor of Southwestern BC, we rarely get out to other parts of the province because there's so much to see in our backyard. Well, this Summer we gave it our best shot and headed out for a road trip to see some other areas of BC. We found lots of great places including: Cathedral Provincial Park, Nelson, Kaslo, the ghost town of Sandon, Vernon, Osoyoos and Keremeos. We also visited two hot springs on the trip: Ainsworth and Naksup. All in all, a great trip that showed us what a big and beautiful province BC really is. 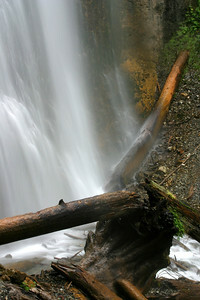 Taken at the base of Bridal Falls. The falls were running heavier than normal due to heavy rainfall during the month of June. The Green Glow... The trees and path to Bridal Falls near Agassiz, BC. Just a short 10 minute hike through a beautiful, emerald green forest takes you to Bridal Falls. We spent the first night of our road trip pulled over near the trailhead and took an early morning hike up to the falls. After packing up, we continued on to Hope for some breakfast. A typical pullover for us on our road trips. 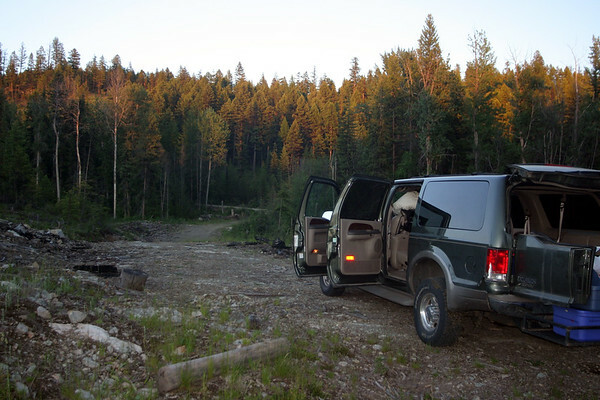 This was an excellent spot because: 1) we didn't see another car the entire night 2) very very quiet 3) not in the way of logging trucks The routine is to find the spot before dark, unload the car to make room for our sleeping quarters (sleeping bags and thermarests). This was our second road trip in the Excursion and we have another one planned at the end of August. Given all the craziness of airports and the expense of hotels, this is by far my favorite way to travel. For the entire road trip, we only broke down one time to grab a hotel room (the Best Western in Vernon BC which is actually very nice). 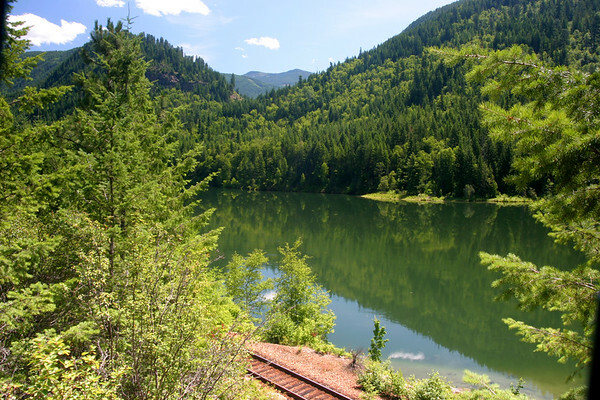 "Green River flows like Grass Melting" - Dispatch - Carry You The Kootenay River just north of Castlegar, BC. Incredibly calm and inviting, but the weather was still a little cool so we decided not to go for a swim. Regardless, this picture epitomizes the Kooetnay area with beautiful rivers and green mountains. 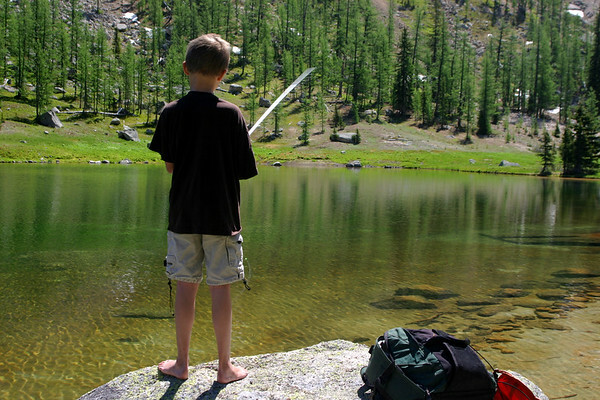 While I was hiking Lakeview mountain, Niko got to try his luck fishing Goat Lake. 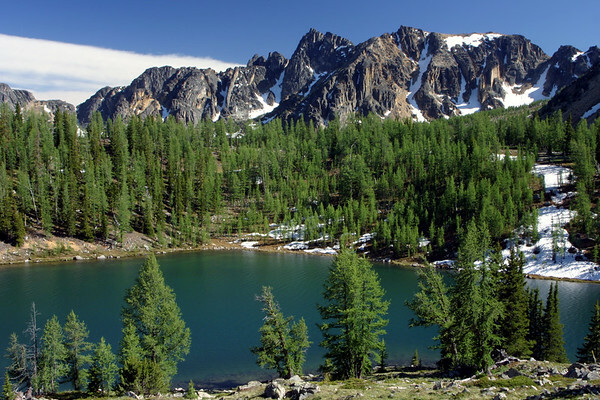 Although he didn't catch anything, he can claim that he fished one of the most beautiful spots in BC. Looking towards the summit of Lakeview Mountain from the col just above treeline. This is the mountain I hiked on my 32nd birthday. Oneea and Niko stayed down at Goat Lake as Niko was not very interested in more hiking. So they stayed back, and I spent 2 hours getting up to the summit, and then a quick 45 minutes descending. Since it was my first hike of the season, I felt really sluggish and out of shape. By the time I got to the top, I felt much better and took 5 minutes to enjoy the views before heading back down. 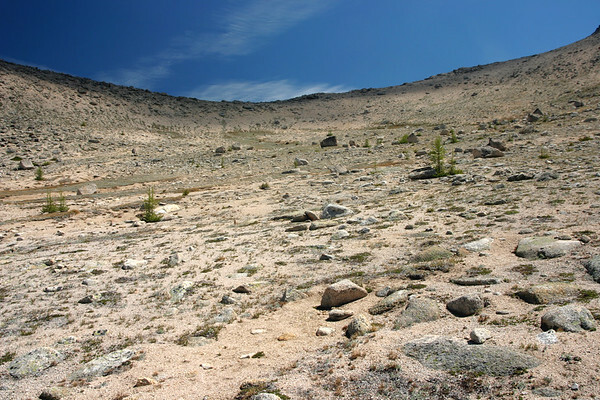 The moonscape between Lakeview and Boxcar Mountain in Cathedral Provincial Park.... By the time I reached this spot, I was completely out of breath and feeling very out of shape. This was my first mountain hike in quite some time, and I was certainly feeling it. The landscape was also so different than what I'm used to in Squamish. I took a quick break to take this picture, drank some really nasty iodine treated water, and then continued up. Once I made the ridge, the wind started blowing again and blew some life back into me. From the ridgeline, it took another 30 minutes to get to the summit of Lakeview. Looking down on Ladyslipper Lake from the Rim Trail in Cathedral Provincial Park. The summit just behind the lake is Lakeview mountain. 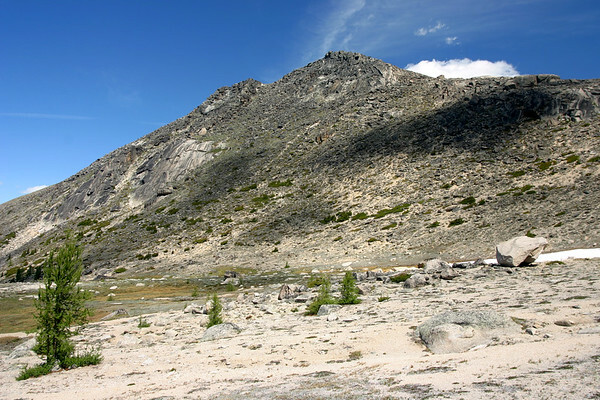 This is the mountain that I hiked just a day earlier as part of my "birthday hike". 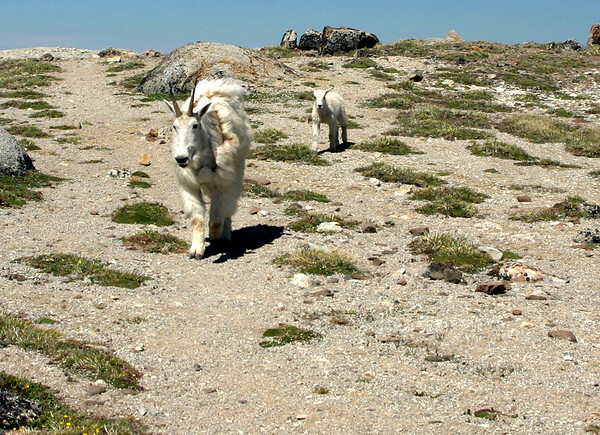 A baby mountain goat with his parent along the Rim Trail. I expected these two to go around me, but after they started walking towards me, I realized that this was their trail and they weren't going to take a detour. Having heard stories of hikers getting charged, I quickly picked up my backpack and backpedalled to let them through. Although they don't look that big in this picture, the adult was about the size of a Great Dane and could have definitely done some damage. There were several others that I ran into along the way, and luckily they let me pass by with no problems. 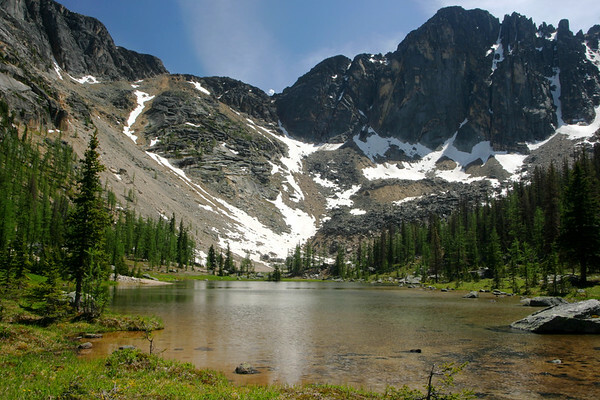 Probably the most scenic spot that I encountered in my two day's of hiking in Cathedral Provincial Park. 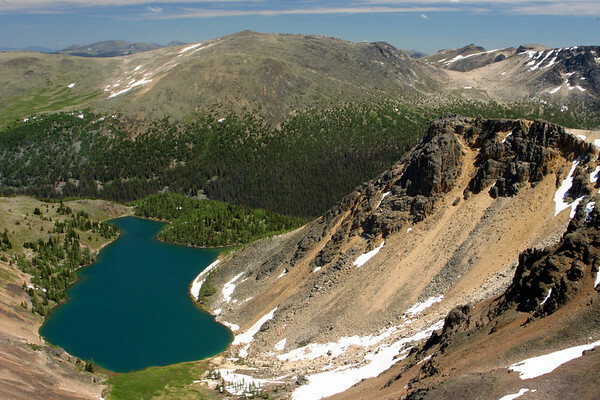 This view of Ladyslipper Lake with Grimface mountain in the background can be found by taking the trail from Pyramid Lake towards Ladyslipper. As you come over the hillside, the view opens up to this view before descending towards the lake. 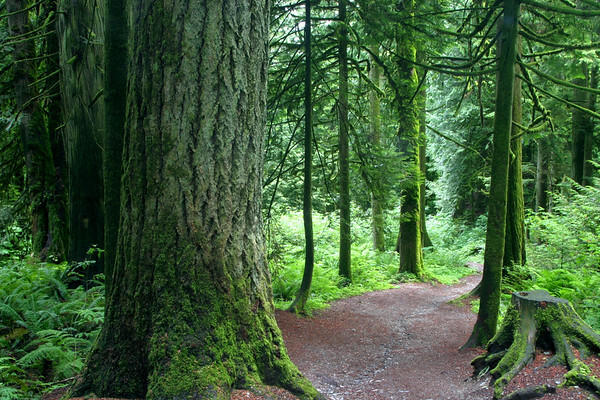 The trees and path to Bridal Falls near Agassiz, BC. Just a short 10 minute hike through a beautiful, emerald green forest takes you to Bridal Falls. We spent the first night of our road trip pulled over near the trailhead and took an early morning hike up to the falls. After packing up, we continued on to Hope for some breakfast.